Clearly it is freezing but let's look ahead to your Personal Style for Spring! It's always so exciting to have a wardrobe clear-out at this time of year and really take stock of your style. If your lifestyle has changed, your job, your body, your perspective, then stop and think "is my style reflecting who I really am?". With that in the back of our minds, there is lots of new stuff in the shops this week and a huge 70's revival is going on. 1. 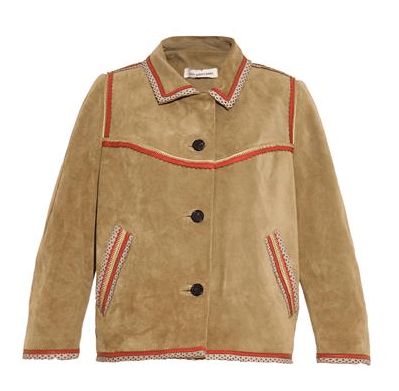 This beautiful Isabel Marant Etoile suede jacket from Matches Fashion will turn lots of heads. It isn't exactly 70's with big collars, belted etc... but that's the whole point. Each time a revival happens the styles are reworked to suit today's woman. There's no need to get a Farah Fawcett flick hair do and wear a polyester shirt! 2. Pair the above with this Stella McCartney A-Line denim skirt. I LOVE A-Line Skirts for their versatality - wear it now with a polo neck jumper, thick tights and boots. 3. Finally, some Topshop platforms. These are good with tights, when it gets warmer choose some sandal platforms with an open toe. Platforms are comfy and the instant height takes pounds off you! If you have been finishing off the Family Circle tin like me after Xmas then these are a God send! If you would like to declutter your wardrobe for 2015 or do some Personal Shopping, get in touch today to see how Lisa can help.